Where this week has gone I’m not sure but I have a full day ahead of me tomorrow, Friday will be an admin day with a few telephone calls to make, Saturday is Market Day and Sunday, yes Sunday is ‘ Dad I’ve got a fish day’, well hopefully young Tales will round off the winter with a pewter and crimson coloured Grayling in the net. With freezing temperatures across the UK I imagine the rolling hills and meadows of Hampshire to have been covered in frost most mornings. The rivers that run through the County I will be coloured unless by chance the run off from the hills has slowed recently but from the looks of our nearby Thames tributaries they are still running fast and with colour. One thing we did learn this week was of a new Gin Distillery based in Winchester, so that will be worth a visit or at least to a local pub that stocks the Twisted Nose Gin, in order to taste its 10 botanical elixir. All week young Tales eagerness has not dwindled, in fact by the time I got home this evening he was engrossed in watching YouTube videos of Grayling fishing, momentarily lifting his head in recognition of my presence he then looked back at the screen. I asked had he learned anything, a prompt response indicated that he had. There were further deliveries today of vintage tackle to The House Of Tales, soon to be offered for sale. A package from West Lothian of dapping flies, a box of Mayflies from Yorkshire and a Hardy reel case from Wales. There are more packages to arrive from a recent buying spree. Hopefully I will have all the items listed and photographed before the end of the month in order to complete the new page on talesbytheriverbank . Well it’s now time to shut the iPad down, a new day will soon be upon us and another day closer to walking the banks of the River Itchen in pursuit of ‘the lady of the stream, the Grayling. It feels like a 24hr fishathon, this time last night we were heading back up the M3 from another outing to fish the River Itchen, the only thing we caught were two small fish however at dusk we saw two large sea-trout and one salmon resting in the margins. What is memorable is the atmosphere, a light mist coming off the meadow, cows silhouetted against the backdrop of trees and a bird of prey circling high above, the river flowed like a stream of indigo dye and starlings formed patterns in the sky as they twist and turned forming patterns in the sky, the evening light fell away and we packed the car to head home. Joining the red snake of tail-lights on the motorway I said to young Tales that we would try again the following day but instead of targeting grayling we would try and catch a good perch. As daylight broke I put all the tackle in the hallway as young Tales slept. The clocks had gone back an hour so it was much lighter at 6.30am. Before we headed off fishing later in the morning the House of Tales took a brisk walk along to tow path, something we hadn’t all done together for a while. Herons stood on guard in their grey tunics as they watched for small bait fish, mitten crabs and shrimps in the outflow steams and pools left by the outgoing tide. After a good hour we had done a circuit via the Wetland Centre and then stopped off at Sonny’s Kitchen to reward ourselves with a light breakfast before the final leg home to pack the car and head of to Lower Sunbury. 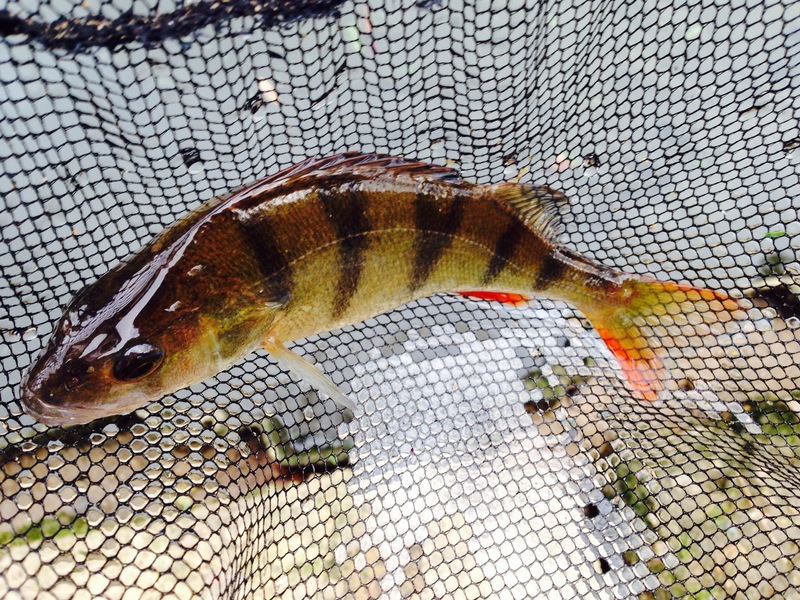 Close to the Lawns at Lower Sunbury we set up on our usual swim in order to target a few autumn Thames perch. With the water flowing with a little colour we decided to float fish but this turned out to unproductive so we switched our set up and attached a small Kammasan Black Cap feeder after a couple of casts this was met with a favourable response as a couple of small dace took the maggots offered on a small size 18 barbless hook. 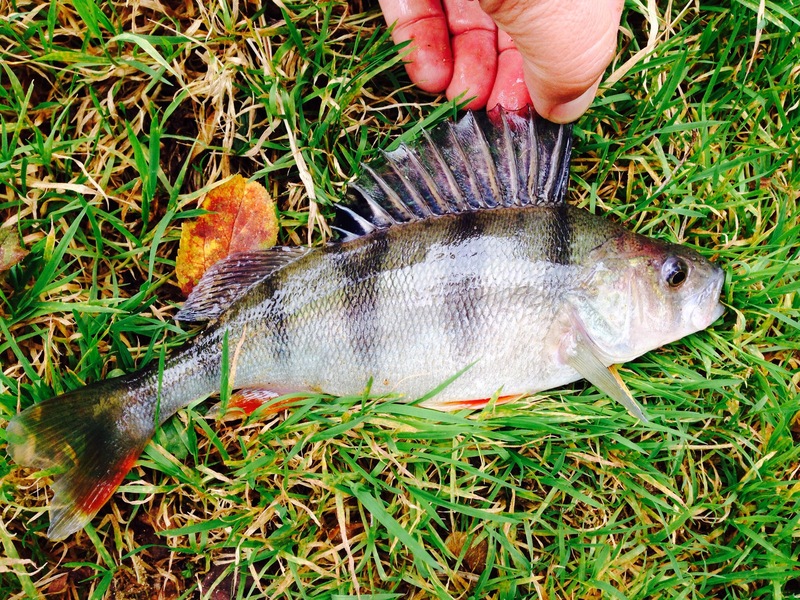 A good cast to the far bank under a tree with deep aubergine coloured leaves resulted in a fine Thames perch, a real little fighter and in top condition came to the net, for young Tales there was a brief level of excitement but he was keen to catch his own. Cast after cast he managed to catch another dace but still not the perch he was so keen to catch, frustration soon led to tears, was this just tiredness, a lack of sustenance or the fact that Percy the perch was shy of making his acquaintance. 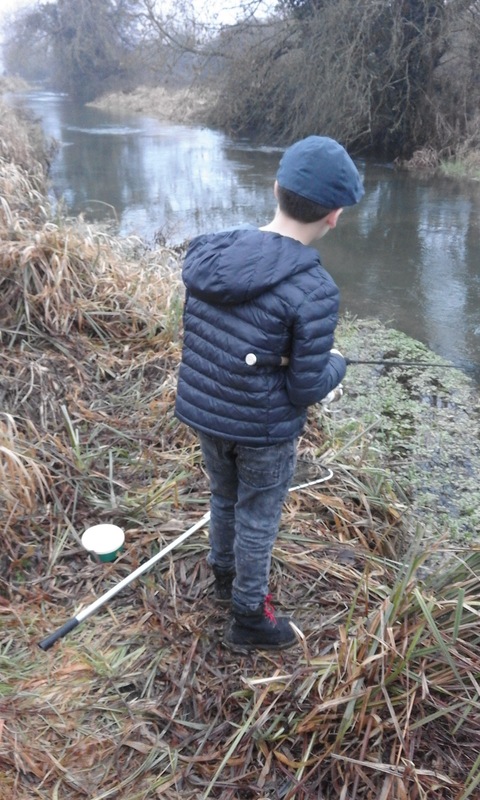 For young Tales it had been a busy day, two fishing forays in as many days, no hibernating on dark autumn days but more memories. I’ve been totally out fished this season by my young son affectionately known as Young Taleshe’s caught the most and the largest fish. Although I’ve been out a few more times and caught fish on most outings I don ‘t count the small perch, dace, roach and other sea fish in the tally. Yesterday there was a small window of opportunity to head back down to the Itchen and to catch up with my old fishing companion Shaun. 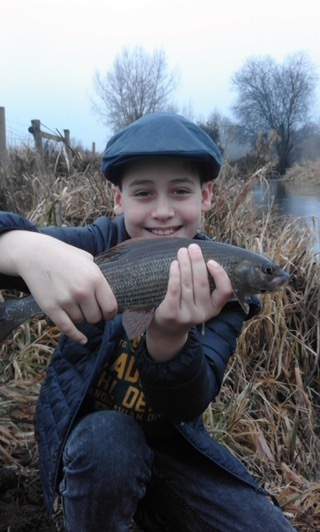 We’ve been fishing together for nearly three decades, mostly trout fishing and when time and conditions allowed spent the odd autumn day grayling fishing. It just so happened that we’d both taken the Monday off to do some general maintenance on our properties. Shaun was in the middle of fitting out his bathroom in his cottage near Bentley and I’ve been busy painting the the inside of the house, however the temptation of such a warm and clear day got the better of us so we downed tools and agreed to meet up mid morning for a couple of hours on the river. The conditions were good although the river was still flowing quickly and with a bit of colour from some overnight rain. There was a slight breeze that put some ripple on the open water and to our surprise we were pretty well the only people out fishing. Most of the river on the spot we fish is lined by trees with the occasional stretch of open pasture that leads to the river where it is lined with bank-side vegetation. There are several small tributaries that run into the main river and it passes underneath a couple of bridges the there are some deep pools that hold fish. We’d been fishing for a couple of hours and without success. The only other fisherman seen out on the river had caught a couple of small sea trout, a roach and a healthy sized perch. He was fishing an area of slack water in between some trees and having to cast to the far bank with a feeder full of maggots. Walking further downstream we came across a deep pool and started to fish. Casting out a small Avon float and suspended below were two red maggots. 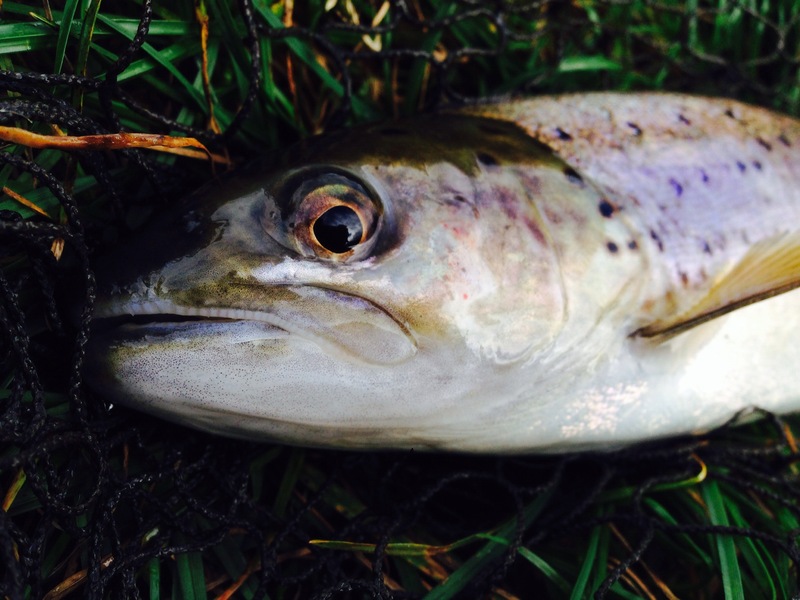 As the float bobbed its way in the swirling current it momentarily dipped either from snagging the bottom or from smaller fish chasing the bait. Time and time again I ran the float down the swim in search of a larger fish that were clearly their as they would tease us by surfacing causing a big swirl as they would take the odd fly from the surface, possibly a sea trout as they were clearly running the river in good numbers. After several casts in search of grayling the only taker was a small sea trout that upon being hooked jumped out of the water several times before gracefully gliding into the net, this was a pleasant way to end a day out and some consolation after having been witness to my sons achievements of Sunday. 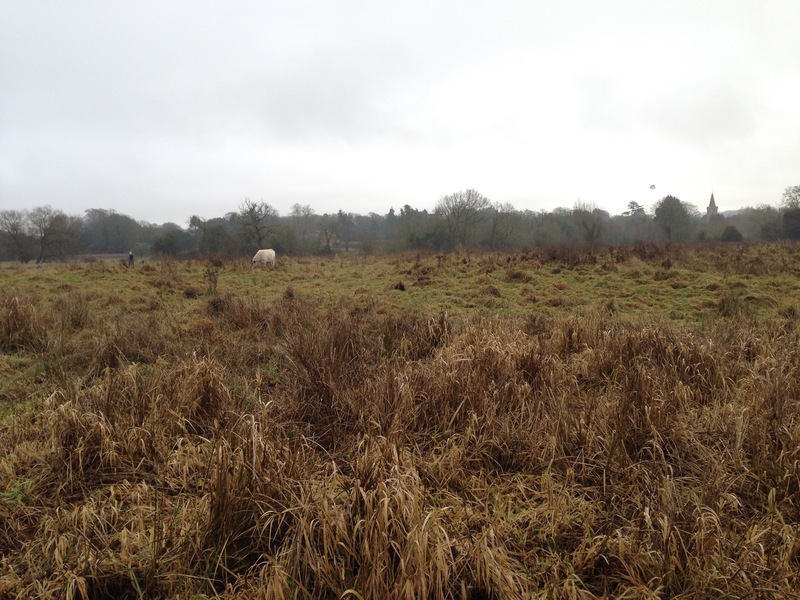 The weather was unseasonably warm, broken cloud gave way to intermittent sun, red kites took to the skies gliding on the thermals and cows grazed in the lowland pastures. 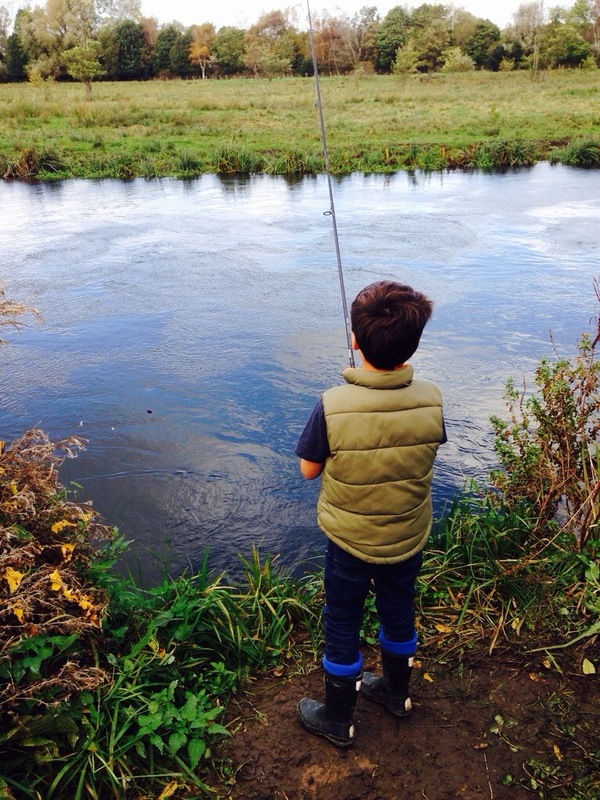 Every now and again the peacefulness of the Hampshire countryside would be broken by the buzz or roar of the planes taking off from Southampton Airport, we were on this day fishing a free stretch of the River Itchen in search of ‘the lady of the stream’, the grayling. Having watched the weather forecast all week the conditions seemed favourable however the overnight rain would impact on our fishing. After the hour or so drive from South West London we arrived by the River Itchen at just after 10.30am. The rods were put together and appropriate reels in order to float fish using maggots as bait. There were several people already on the water, it ran clear if not a little too fast so fishing wasn’t going to be easy. Having spoken to a couple of local fisherman they mentioned that there was a good run of sea-trout so there was the likelihood that one of these fish may also take the bait. As the hours past the only bend in the top of the rods came from the bunches of weed that made its way downstream with the flotilla of autumn leaves. Every now and again we would see a fish rise in a swirl of water, the rippling water fading out as the current dispersed the rings. 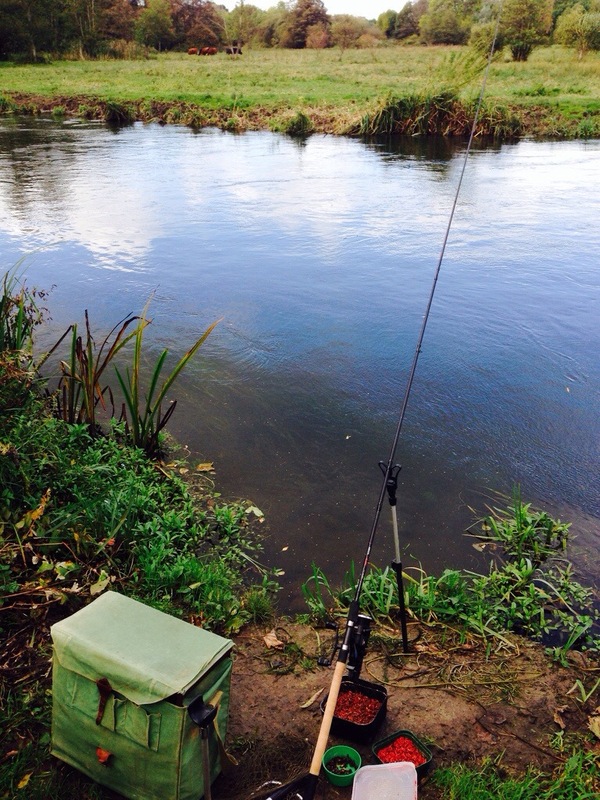 I had found myself a small opening on the riverbank, I placed the old Efgeeco tackle box on the muddy bank and set up the rod on the rest and watched the tip. Gazing across the meadow I was aware the young Tales was doing his own thing, now a competent fisher I left him to fish on his own, always mindful of the dangers of any river he was safe enough and within constant watching distance. 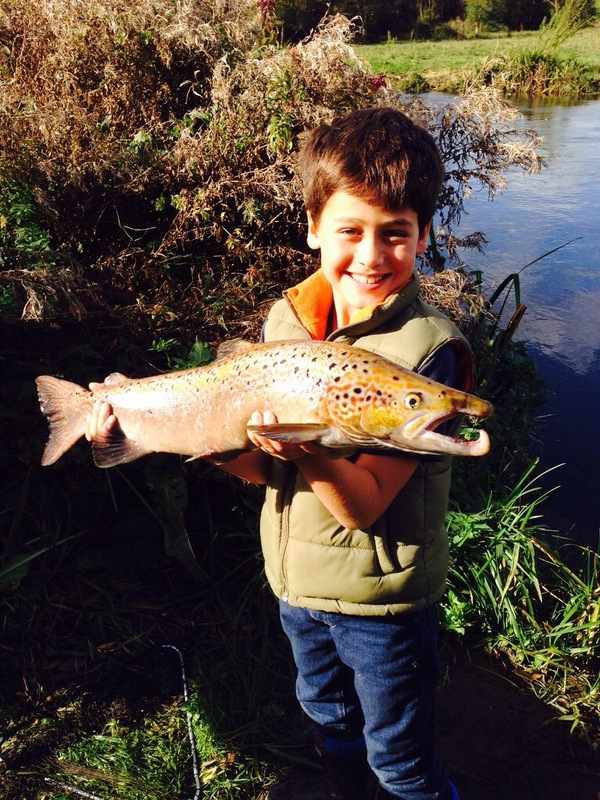 Young Tales would now and again shout out “dad, there’s a big fish”…was this just the eagerness to catch something, could he see the trout running through the weeds or was it his imagination. It wasn’t long before I heard another shout, this time, “dad, I’ve got a fish!”, I glanced to the right to see his rod bent right over and Young Tales hanging on for dear life, what on earth had he hooked. I rapidly made my way to him, net in hand and when I got to him he said, “it’s huge!” Looking over the bank down to the water sure enough there was a large mass of Silver and dark grey swirling around in the water. I needed to look twice, it wasn’t a sea-trout but a salmon he had hooked. I could only deduce this from the prominent ‘kype’ on the lower jaw. Clearly a large male fish. It ran and thrashed about for some time as Young Tales held on. I told him to walk back and keep his rod up in the air so I could lean down and get the net beneath it in order to land it. Well this was more than we had bargained for, a sea-trout was one thing but a salmon was a surprise. Once netted and on the bank we carefully unhooked it, took the trophy photograph and then returned the fish to the water. I’m so proud of my Young Tales. He’s out-fished me all season and good for him. To see the excitement in his eyes and to know that memory will last a lifetime is worth every minute of taking him to the river. . The banks will be full over the next few days as fisherman go in search of personal bests and specimen fish. Ground bait and maggots will be thrown in to temp the last knockings and many will pack their tackle up for a few months whilst the fish court and spend time spawning. At least some wives will get their husbands back. 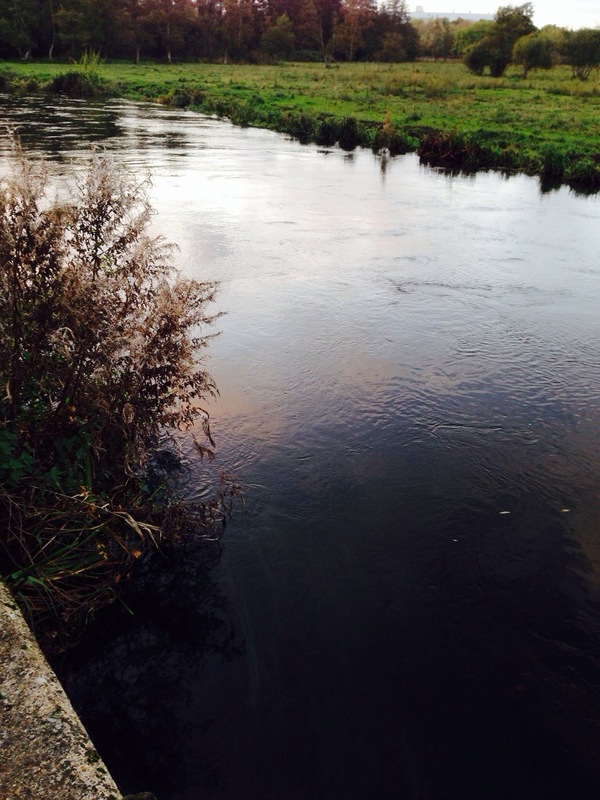 I’m planning a trip with Eddie to the Lower Itchen on Friday for a last chance at trotting for grayling on this beautiful Hampshire river where for me it will be as much for the fishing as getting away to forget about the stress of this week. Hopefully the weather will be kind so I can take some good photographs as well of this idyllic location. As the temperature continues to drop I am happy to sit by the fire and read the latest edition of Trout & Salmon and look forward to the start of the new season. With reports of springers being caught and the thoughts of days out in warmer weather I review what flies there are for an early season trip to the Itchen. A recent purchase from a well-known online auction site of a small shoal of Rapala lures will help with early season salmon. I prefer to fish a fly but sometimes a small Rapala or Devon will do the trick to tempt a salmon from the tangle of tree roots by the water’s edge. Having fished the Tamar several years ago it was the small CD5 that accounted for some ferocious takes, especially when cast to the opposite bank and slowly retrieved through a deep pool or cast along the bank. No doubt a cold start tomorrow so a trip to Arcadia to see finds from Kempton and for a cup of tea may be in order.